With only $500 and a ton of ambition, Kristi Brocato began The Basketry in 1995. An idea that was born in a college dorm room quickly developed into a blossoming gift basket business. It all started with one $25 fruit basket, which Kristi brought with her to one of her college courses before delivering to a very lucky recipient. With that first basket sale, she knew that it was her destiny to make baskets for people worldwide. 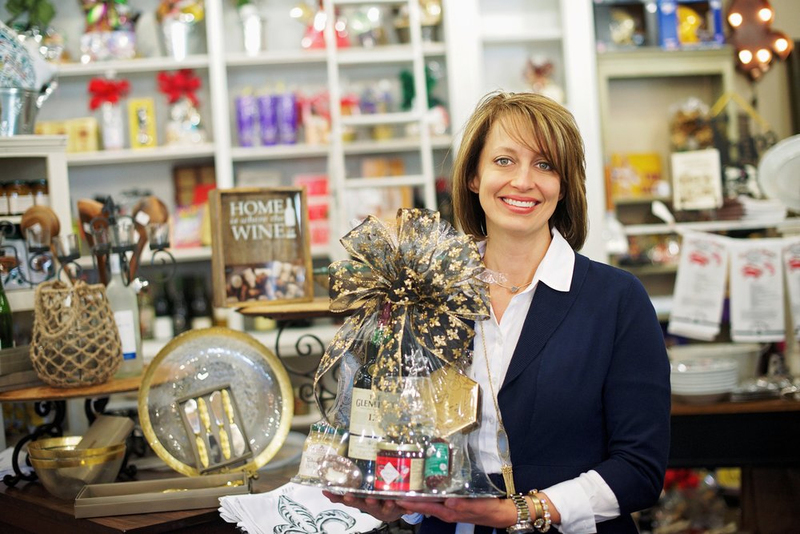 Her business continued to build, with each basket sale funding her to create the next basket. As more and more people saw The Basketry’s work, the orders began flooding in. After substantial growth and several requests from customers to get in new products, Kristi decided to open a retail store in 1996. This allowed customers to shop while their baskets were being made or pick out exactly what items they wanted to include. After 14 great years, Kristi had outgrown her store on Wade Street and it was time to move into a bigger space. She built a new store from the ground up, and custom designed her production counter so that more baskets could be made. As The Basketry brand continues to grow, Kristi remains committed to the principles that began the company, “Provide beautiful gifts that make people smile, and have a lot of fun in the process.” It is this magic that continues to drive Kristi and her entire Creative Team to make The Basketry a very special place to shop. The Basketry is more than a gift basket company that provides beautiful and high quality gift baskets. Each of our team members sincerely values your gift giving experience, and we want your colleagues and loved ones to love the gift they receive. From custom designed gift baskets to unique gifts to treats just for you, there’s a little bit of everything inside The Basketry doors. Shop online, visit our store, or give us a call to experience a little bit of The Basketry magic! Thank you for shopping with us, and we hope you enjoy the experience!